It's official! The Mister is spoiled! When I bought this domed caked saver at a second hand shop just a year ago, the salesperson told me I needed to keep it filled and not let it gather dust. Little did I know that the Mister would demand, insist upon be surprised to find a new dessert nearly each week...and so "Cake Dome Sunday" was born. We are now up to dessert #25 !! WOW! 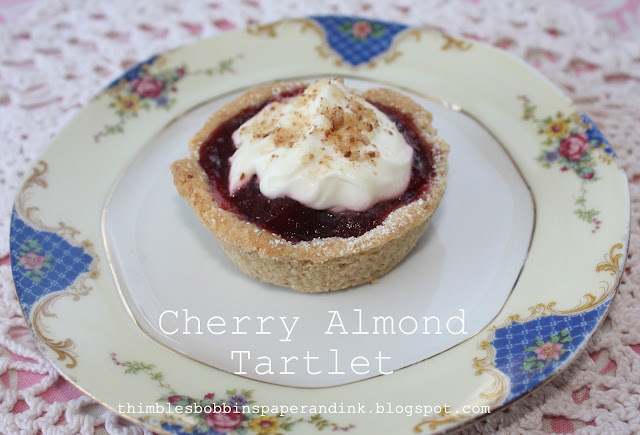 Today's Cherry and Almond Tart and Tartlets are a huge hit in our house! You can make the components of it in advance and put it together right before serving if you need to. The tart pastry is made of ground almonds, a little sugar and butter. The cherry vanilla filling is a simple jam you cook on the stovetop. The whipped cream topping was supposed to be Creme Fraiche but I improvised and made a whipped cream and Greek yogurt topping that rivals any creme topping you've ever tasted. After preparing the almond pastry and lining my 9" tart pan with the pastry, I had a little bit of left over almond pastry left with just enough to roll out about a 1/2 dozen little tartlets. For the cherry vanilla jam filling, combine the ingredients in a saucepan and stir over medium high heat until the sugar dissolves. Bring the mixture to a boil and cook, stirring constantly, until the mixture reaches the setting point, about 6 - 8 minutes. (Note: To test for the setting point, place a couple of small plates in the freezer before you start cooking the jam. When the mixture becomes thick, remove it from the heat and spoon a small amount of jam on the clean, frozen plate. Wait about 30 seconds and then run your finger through it. It should be "set" if the mixture will hold a trail as you draw your finger through it. If not, continue cooking a few more minutes and then try again on another frozen plate.) When your jam is set to your liking refrigerate it until it is well chilled (1 or 2 hours). 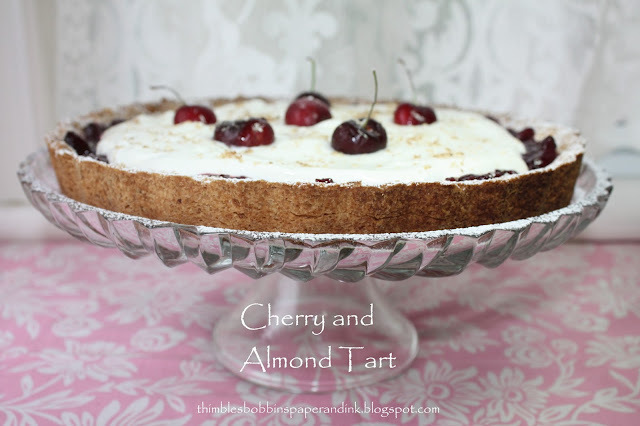 Once you've prepared the cherry vanilla filling it is time to prepare the almond pastry. In a food processor, process the almonds until they become coarse crumbs. (Reserve a tablespoon or two of the crumbs to sprinkle over the top of the finished tart later if desired.) Beat the butter and sugar in a mixer until light and fluffy, scrapping down the sides of the bowl. Add the flour and the almonds to the butter/sugar mixture and beat to just combine. Form into a disc, wrap in plastic wrap and refrigerate for 1 hour to rest. Preheat the oven to 350 degrees F. Roll out the pastry on a lightly floured surface to about 1/4 inch and line a 9" fluted tart pan, trim edges and refrigerate until firm. After it has chilled, lay a piece of parchment paper over the almond pastry and weight with pie weights (dry peas or beans make excellent weights). Bake in 350 degree oven for 10 - 12 minutes until lightly browned. Remove parchment and weights and continue baking until golden and crisp (6 - 8 more minutes. Cool completely. For the whipped cream topping, whisk the cream and powdered sugar in a chilled mixing bowl until soft peaks form. Gently fold in the Greek Yogurt until blended. Refrigerate until ready to use. To serve, spread the chilled cherry vanilla filling onto the base of the cooled pastry. 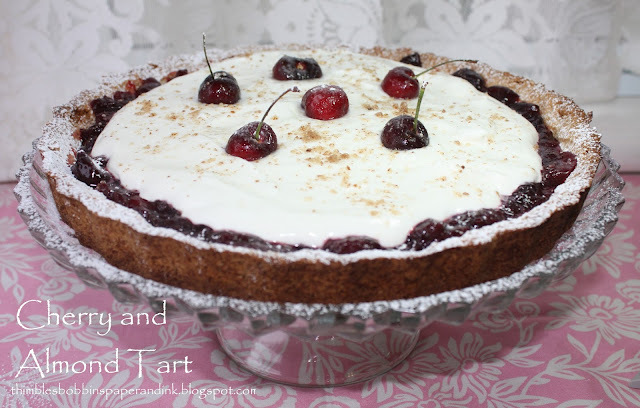 Spoon the chilled whipped cream/yogurt topping over the jam and top with fresh cherries and dust with powdered sugar, a dusting of almond crumbs and serve. 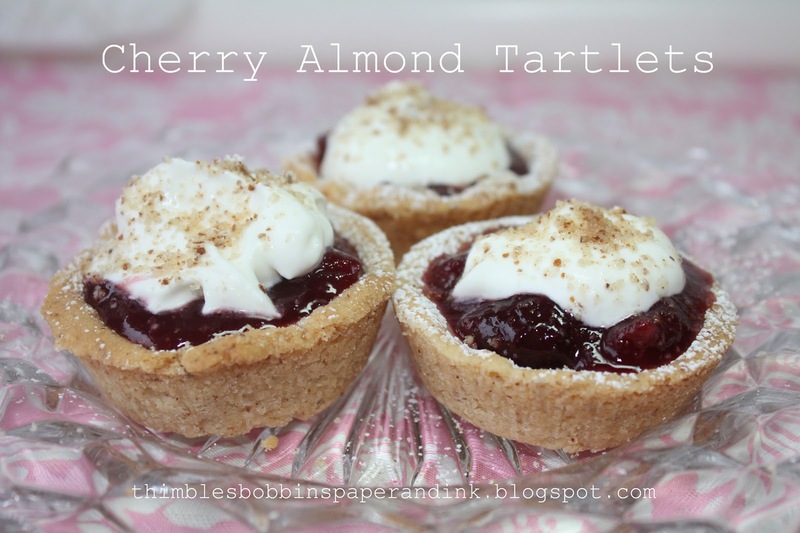 If you have made little tartlets, assemble them in the same manner and serve. I would love to know if you would enjoy it if I started and hosted a "What's under your cake dome" linky party? Once a week I'd open the linky party and you could link up any type of sweet treat you've made and it would link back to your own blog. 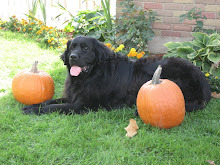 For the past year I've had a great time joining linky parties all over the blog-o-sphere. These linky parties allow you to "meet" new friends and gather new tips, ideas and recipes too. Please leave me a comment if you'd be interested and like for me to set it up. 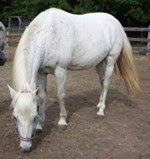 I will try to figure out the details on adding "Mr. Linky" and we could begin next week. You are the "bestest' cook Jennifer. Hey would you send me your address? The only thing better than a bowl of cherries has to be your desserts! I want more! I found you through Wordless Wednesdays...come visit me at Blue Plate Sundays! I love both cherries and almonds. this looks as pretty as I'm sure it is tasty. Your hubby is one lucky man. I think the party would be fun. I would love to join if you start it. I try not to bake a lot because I have a sweet tooth. lol! But once a week can't hurt. Thanks for sharing with SYC.